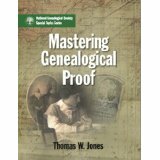 The Gen Proof study groups are organized to study the book Mastering Genealogical Proof, byThomas W. Jones. This is an exceptional textbook detailing the application of the Genealogical Proof Standard (GPS). The exercises will help you develop the skills you need to be comfortable applying the GPS to your genealogy work. This study program will consist of small groups of approximately 15-20 members and a mentor who will guide the discussions and answer questions. Group 42 with Melanie Holtz, CG as mentor begins August 3rd. This is an ADVANCED group. Group 43 with Cafi Cohen as mentor begins on August 17th. This is a Beginner/intermediate group. Thanks to an arrangement with ProGen, the Gen Proof Study Groups now have the opportunity to use Basecamp as a platform. Basecamp is a project management platform that allows students to pose questions, participate in discussions and upload assignments. The group will not meet at a designated time but have ongoing discussions throughout the week. The mentor will log on each day to answer questions and highlight certain concepts, and participants should check in daily also. Basecamp is the same platform used for the ProGen Study Groups so some of you are already familiar with it. There will be no expense involved to participate (other than the cost of the book). Each Gen Proof Study Group has their own private Basecamp group where they can ask and answer questions, submit assignments and examples and discuss the book content and assignments. Once you have been assigned to a group you will receive a confirmation email. After your group fills, you will be contacted and given access to the private Basecamp community for your group discussions. The discussions begin on the date designated. The first week / discussion will begin right off discussing the preface and chapter one. The second week / discussion will cover chapter 2 including the reading and exercises, and will continue with one chapter per week, according the schedule set by the mentor. If you have any questions please feel free to ask your mentor, or email Michelle Goodrum at michelle.r.goodrum@gmail.com.